Sometimes when you’re a sailor you want to get out there and sail fast and hard and just have a good hoot and holler. You want the sailing version of a rock concert. Unfortunately, Galapagos, as great as she is, is more the sailing equivalent of a night at the opera. She is lovely and cultured and refined, not fast and furious. That’s when it comes in really handy to have sailing friends with smaller boats. And that’s especially true when they are young and just getting feet wet in the world of sailing and want to turn all the handling over to you so they can watch what you do. Are you kidding me? Woo hoo! Let’s go! Thus it came to pass that we were taking a tour of our new friend James’ boat and he mentioned that he’d like for us to go out with him on his new-to-him Pearson 35 “Morgon Stjarna” (Swedish for Morning Star). He is new to sailing and looking for experience. We have a bit of that. All of us had filled calendars in the near future, so we decided to just drop everything and go. Don’t you love that? I really do. I love this ‘spur of the moment’ ‘let’s just do it’ kind of thinking. I mean, we can work on our boat anytime. And we do. I vote for going sailing on a Pearson 35, especially as there was good wind today. 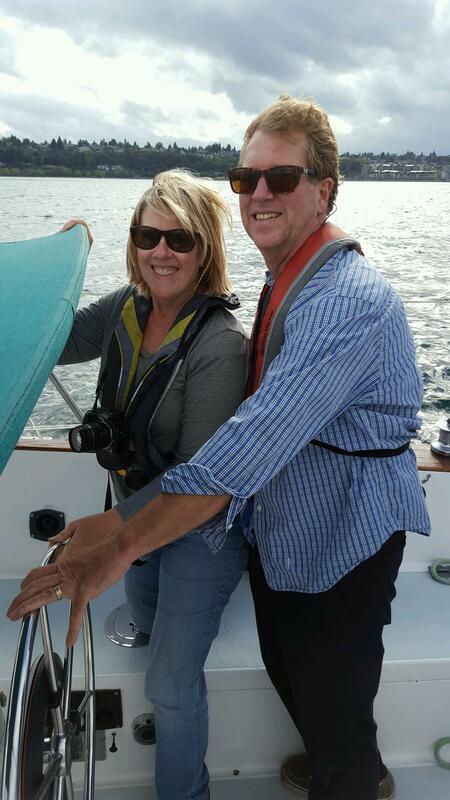 Sailing on this smaller boat reminds us of what we love about sailing. We like the feeling of the wind and the water, the heeling of the boat, the wheel work, the tweaking of sails. We love it all. And we love how easy it is to take that boat out and get her back into the slip. Galapagos would have loved being in that wind today, but it was just so much easier to take Morgon Stjarna out, and the experience is completely different than sailing our queenly vessel, so high up off the water, so protected from the weather in our fine cockpit. We love out boat and we are glad to have her. She is perfect for what we want to do. But we also love James’ boat for completely different reasons. Hey! Maybe we just love boats! 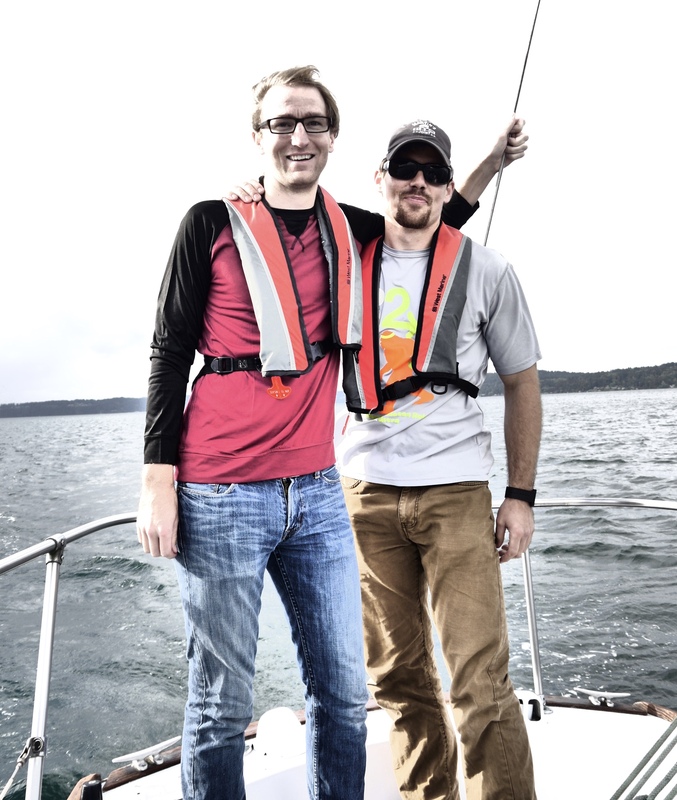 This would be James’ first real sailing experience on his boat and we felt happy to be the people on board with him and his roommate Kelvin, also new to sailing. Checking the weather, it looked like wind of 11 knots with gusts up to 19. That’s good sailing weather for us but maybe more than the guys bargained for considering their inexperience. On the inside of the bay, the wind was great and we tooled along under full main and jib doing about 6 knots. Loads of fun and the boat was handling well. James and Kelvin were in their element. Kelvin and James, safe and sound and still on board the boat. As we got out toward the channel, we started getting whitecaps and steadier, heavier wind coming from the south west. I’m thinking that 11 knot forecast was, well, wrong. What a shock! Soon we were heeling magnificently, and while that can be fun, it’s not a very efficient way to sail and looking at the fellas, I saw white around all of their many eyes. It was apparent that we were overpowered. We immediately reefed the jib but even so, there was a little too much heeling action and weather helm for it to be right. It was a brilliant opportunity to teach James about how his boat will head into the wind if you let her, and how if you release the main and spill wind she is going to pop up. Although it was a probably a little too soon in their sailing careers for those lessons, I’ll bet neither Kelvin nor James ever forget them! We soon decided to just pull the jib in completely, and Mike and James went forward to reef the main as well. “Keep your center of gravity low, and keep one hand on the boat at all times.” It’s the mom in me. I couldn’t help this little reminder. This was James’ first experience really sailing his boat and it was a little bit of trial by fire. He already knows now what it feels like to be on the foredeck in fairly heavy wind. That’s a pretty exciting place to be, and not always in a fun sort of way. He did well, albeit with eyes wide open now to the force of mother nature in action. You know, we forget how it feels to be brand new at this sailing thing. After years of sailing this bay, we take things like a quick heeling to 30 degrees for granted and don’t even break a sweat. We know the boat will come back up and what to do if she stays over too long. I was so glad for James and Kelvin they could see Mike and I loved every minute and were not in the least out of our comfort zones. During a more sedate part of the sail. We were too busy sailing to take photos during the squirrely part of the adventure. I remember years ago being taught how to sail our Catalina 27 and how I watched the previous owner who was on board with us. He was just calm and secure in his ability and in the boat’s ability. We had very brisk conditions and I could have been scared if he had shown any worry at all. But he didn’t, so I didn’t. I hope we were able to pass that on to James and Kelvin, in spite of all the joking about wetting one’s pants! The boat was not actually challenged in any way. We know from our experience that our boat can take more than we can. And that’s true of James’ boat as well. With reduced sail we made good time across the bay, trying to out run a rain system coming up behind us. It was no good, though. It caught us just as we were getting ready to start the engine and take down the sail. By the time we were motoring into the fairway, I was hunkered down underneath the dodger, staying as dry as possible, memories of Moonrise, our old Cal 34, floating through my mind. In the bay, Alpha Happiness stood witness to the wide eyed wonder of new sailors and to the happiness of these kind of older ones. Apropos. Completely. James brought Morgon Stjarna into the slip, his first time docking bow-in, nailing it perfectly the first time. He’s going to love sailing this boat as he gradually gets used to her, learns her ways, and is guided by the many more experienced sailors waiting with open hearts to give him a hand. Sail on, Sailor!